Cubresa SPECT Scanner Used for Evaluation of Alzheimer’s Disease Molecular Label in vivo | Cubresa Inc.
Representative WT (wild-type, left column) and 5XFAD (Alzheimer’s model, right column) brains at the mid-coronal level. Row A: Histochemical staining of BChE, revealing marked elevation of BChE in AD, notably in the cerebral cortex. C = cerebral cortex, H = hippocampus, BG = basal ganglia, Th = thalamus, A = amygdala. Scale bar = 1mm. Row B: CT with co-registered MR at the same level as Row A. Row C: SPECT images acquired at 4 mins post-injection with co-registered CT/MR and ROIs. Marked retention in the cerebral cortex is evident in the 5XFAD brain compared to the WT brain and to a lesser extent in amygdala, hippocampus, basal ganglia and thalamus. Images courtesy of the Darvesh group and BIOTIC. Cubresa’s SPECT scanner was used to determine if a novel molecular label, TRV6001, in development for in vivo imaging of the BChE enzyme present in the brains of Alzheimer’s Disease patients follows the known distribution of the enzyme in animal models of the disease. Winnipeg, MB – November 22, 2016 – Cubresa Inc., a medical imaging company that develops and markets molecular imaging systems, today announced that their compact SPECT (Single-Photon Emission Computed Tomography) scanner was used in a study by Dalhousie University and Mount Saint Vincent University researchers in Halifax, Nova Scotia to help evaluate the diagnostic potential of a new molecular label that could lead to the early detection of Alzheimer’s disease in living patients. Alzheimer’s disease (AD) is a progressive neurological condition that causes dementia and for which there is no FDA-approved treatment for the underlying disease. There is a need for a non-invasive way to detect and diagnose the disease in living patients because definitive diagnosis still requires post mortem examination. The study was performed by Dr. Sultan Darvesh and his research group at BIOTIC (Biomedical Translational Imaging Centre) at the Izaak Walton Killam Health Centre in Halifax, and was partially funded by TREVENTIS™ Corporation of which Dr. Darvesh is a scientific co-founder. SPECT imaging provides 3D information with a high degree of sensitivity and specificity for detecting the presence of a particular radiolabeled enzyme, in this case the BChE (butyrylcholinesterase) enzyme. Prior research has shown that elevated BChE expression levels are associated with abnormal ß-amyloid (Aß) plaques in the brains of Alzheimer’s patients. The novel molecular label, TRV6001, was synthesized and determined to bind to BChE with high specificity before being injected into 5XFAD mouse models of Alzheimer’s Disease. TRV6001 is still under development and has not yet been shown to be safe or effective in humans. “SPECT imaging has provided us the first direct in vivo evidence that the TRV6001 label can cross the blood-brain barrier and actually exhibits higher retention in the brains of AD mice (whose BChE level is markedly elevated) than in normal control brains,” said lead author Drew DeBay, Ph.D. candidate at the Department of Medical Neuroscience, Dalhousie University. 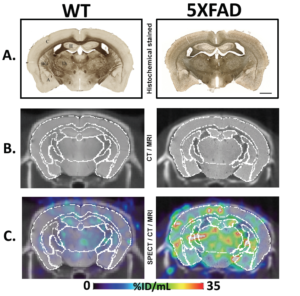 In addition, the retention in BChE-associated brain structures was shown to closely follow the known histochemical distribution of BChE that has been previously established in AD mouse models. The research was presented this year at the Alzheimer’s Association International Conference® (AAIC®), the world’s largest forum for the dementia research community, in Toronto, Canada. Dalhousie University is internationally known as one of North America’s most welcoming universities. Founded in 1818, Dalhousie is one of Canada’s oldest universities, attracting more than 18,500 students from around the world. Located on Canada’s East Coast, the university blends world-class academic programs with leading-edge research. Visit www.dal.ca for more information. Recognized as a leader in distance and experiential learning, and based on a strong tradition of social responsibility, Mount Saint Vincent University takes a personalized approach to education to nurture socially responsible global citizens. Founded in 1873, the Mount has been nationally recognized for having one of the lowest student-to-professor ratios, for providing students early access to valuable research opportunities, for its legacy in the advancement of women, and for facilitating critical advancements in food security, healthy aging, literacy, and childhood development. Visit www.msvu.ca for more information. The IWK Health Centre is the Maritime region’s leading health care and research centre dedicated to the well-being of women, children, youth and families. In addition to providing highly specialized and complex care, the IWK provides certain primary care services and is a strong advocate for the health of families. The IWK is a global leader in research and knowledge sharing, and a partner in educating the next generation of health professionals. As part of the IWK Health Centre, the Biomedical Translational Imaging Centre (BIOTIC) has an explicit mandate to translate medical science innovations with industry partners using clinical and preclinical imaging tools to produce next-generation healthcare advances. Visit www.iwk.nshealth.ca for more information. TREVENTIS is headquartered in Southeastern Pennsylvania and has research operations in Halifax and Toronto, Canada. The company is focused on the discovery and development of disease-modifying small molecule drugs for a variety of dementias including Alzheimer’s. In addition to its therapeutic programs, TREVENTIS has a novel approach to the development of diagnostics for early diagnosis and monitoring treatment effects in Alzheimer’s disease. Visit www.treventis.com for more information.